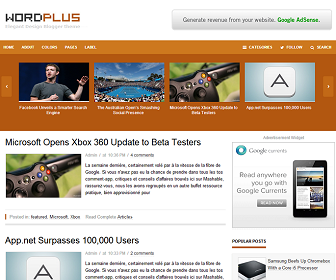 WordPlus blogger template is another new creation of 'theme-junkie' best suited for News, Magazines, and Blog websites. Bloggers who likes to make their posts more prominent on their blogs, so we designed a slider in such a way that emphasizes more on posts rather than just on blog color schemes. Apart from this and all other typical navigation bars, wordplus template has new way of presenting it's child category items in unique and separate style. User can use Worplus theme in 3 More Color Schemes. 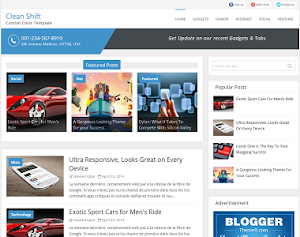 Let us know what you think of this blogger template! We would love to hear your comments. @Admin,That is exactly why i keep saying you are the Best thing to happen to Blogger CMS. Thanks,THANKS for considering my request.. I like the header feature you've added on you blog. Very well done! Its all become possible due to your easy coded template. Thanks for everything mate! Praying for you and blessings for your future. i changed the theme color to Blue (following the above instructions) but the icons (categories, follow and search) and the content slider's left and right buttons are still in orange. please help. thanks! i already managed to change the left and right buttons to blue color. now the only problem is the icons (categories, follow and search) that will perfectly match the blue theme :) thanks! change height from "385px" to "158px"
We've contacted them for permission but they don't even bother to response. I'm testing this out. Thanks for your work... 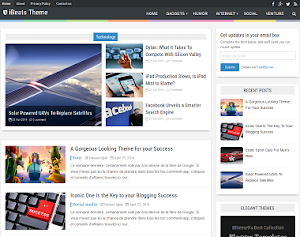 This is my first time installing a blog theme besides the defaults. I used WORD to find and replace everything to change my color to black. Here is my issue. I put in a few test posts, 2 with images, one without. The slider bar flashes the images for a quick second, then they disappear. Have I done something wrong that you could identify from my description? I want to make sub menus in the drop down menu! Can you help me out? When you'll see the image you'll see "Item 1" , "Item 2" , etc. I want that! May I have Slider on every page/post instead of only Homepage? Remove it and you're done! Thanx Naveed Bro! I'll apply and will inform you soon. Dear Naveed. The method works but not completely, there is some mixup with Post and Slider. Check this link http://www.premiumsoft.tk/2013/10/fourth-test-post-title.html and guid me please. remove and you are done! Bro! after doing this. Post body alignment goes to left side including right side widgets. Header and Footers are fine in centre. Solved. I just pasted [margin: -91px auto 0; ] code again with margin 0px and it works for me finely... Thanks Naveed Bro for your support. For slider left and right button, find "#C26917" and replace with "#388FBA" (twice). find the matching color icon or wait until i change mine. i´m from spain and i change the icons catetories, follow and search colours in blue. you must go the line 80 and paste this until the line 83. Sorry my english is not very correct. How to "Justify" text of post in Homepage? Worked! Thanks once again for your kind feedback and support. 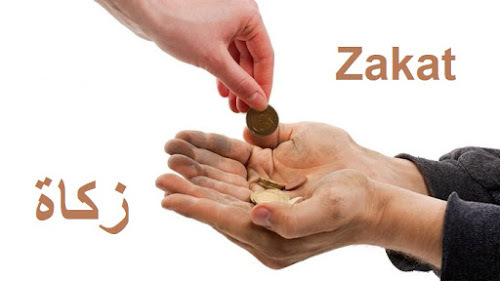 I need your help please give me your contact email please. As the question is not relating to this template due to which i'm not sharing here. So please help me and I'm definitely sure you can. Can you tell me how to increase the size of posts in the main page? And also increase the size of posts in scroller? When you open my blog! I want to increase the height of scroller ( i.e in which posts are changing after some time). The thing which is below page names and search and all! And the individual posts in the main page, i want to increase the height of them! 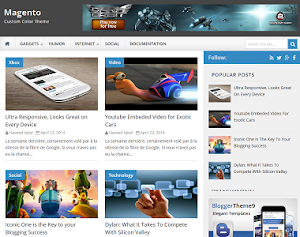 And also get more number of posts in the main page! I want to integrate an image at the top and bottom of each post! You'll see a download icon at the top as well as at the bottom! I want exactly that in my blog! And also that "download" image should not become the post image! Awesome theme Admin! But I have a slight problem my blog description is not fully visible please tell me how to fix it.. Otherwise It's a really good template... Keep up the good work! 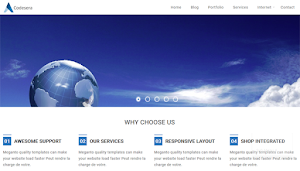 Thank pretty cool template..Please me know if it is suitable for SEO performance as well. My home button is brown color... Please HELP !!! I am using this template, now need some guidance from you.. I want to design the Sidebar Widgets Titles, all in once can you suggest me the exact code for changing it's design?